There is particular type of food which is deemed not very ideal for your health if you eat every day, but you can never stop loving it. 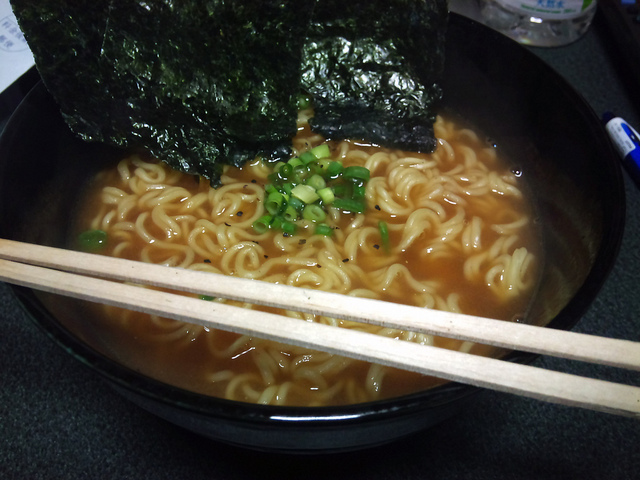 I believe, for the most of Japanese people, instant noodle can be one of them. Do you feel the same?? Good!! Because I am going to write about a shop to find a surprising variety of instant noodle in Japan today. Ramen is one of Japanese soul food, and of course enjoyed at home, too. When we cook ramen at home, we generally use instant noodle unless you have a nice set of raw ramen noodle and liquid soup pack. It is not only popular as a mum’s quick lunch or easy family dinner (or of course, everyday dinner for busy/ single business men! ), people nowadays tend to store some as an emergency food in case of natural disaster i.e. earthquake. 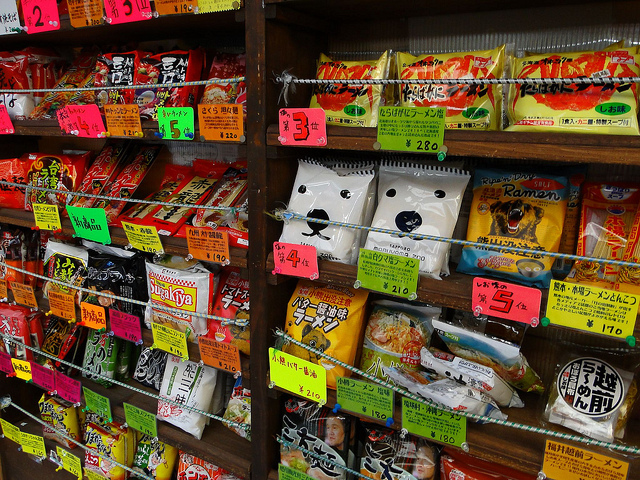 If you go to any supermarket in Japan, there is usually a ramen section in grocery floor, but it seems there is an instant ramen specialised shop in Osaka selling a lot wider variety of ramen than regular supermarket! This instant ramen shop called Sakura is situated in Nipponbashi, Osaka, and it sells over 200 types of instant noodle from all over Japan! According to an article, customers are not only single business men, but married men who wants to buy his home tome ramen to share with his family, and mums who look for non-fried ramen noodle considering family’s health. In addition nationally available ramen, this place offers region limited ramen as well as region specific luxury ramen. Usually price range of instant ramen available in supermarket is about 100 yen (US$0.95) to 300yen, and 300yen a pack ramen is deemed luxury one. But this ramen specialty shop in Osaka has 500+ yen/pack Okhotsk ramen with mineral rich salt from Lake Saroma! Most popular ramen of this shop is Hokkaido ramen which uses dashi broth taken from Rishiri Konbu sea weed. Another good thing about this shop is that they give you an advice on what additional ingredients (i.e. vegetable, seafood etc.) are the best suited for each ramen so you ramen making experience can be fail proof 🙂 Maybe you can learn some magic ingredients to make you an advanced home ramen cook! Please let me know what is your favourite noodle 😛 I will be looking forward to hearing from you!